Herbes de Provence, or Provençal herbs, are a traditional blend of aromatic herbs that grow in hills of southern France during the hot summer months. Used by the handful when fresh, they are also good to dry and store. 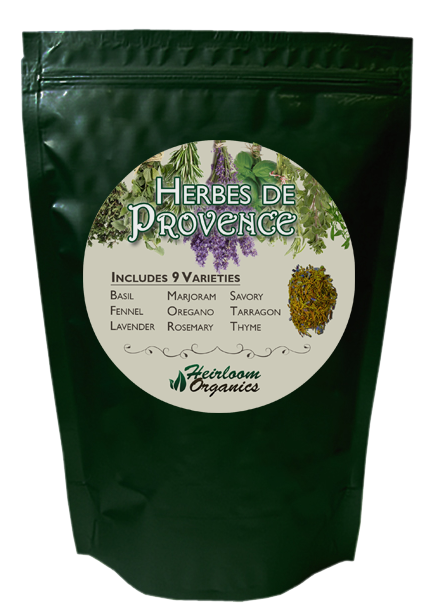 Herbes de Provence are a good addition to any dish from the Mediterranean region and especially good mixed with olive oil to marinate meat like chicken, fish or game, or used in salads and sauces. You can add this classic French blend of fragrant herbs to tomato and vegetable dishes as well. Include a splash of this flavorful blend in dips and dressing, soups and salads, sides and entrées. A distinctive but not overpowering blend that you will find enhances a wide variety of foods. Grind rosemary and fennel seed in a grinder; transfer to a mixing bowl. Stir savory, thyme, basil, marjoram, lavender, oregano and tarragon with the rosemary and fennel. Store in an air-tight container between uses.